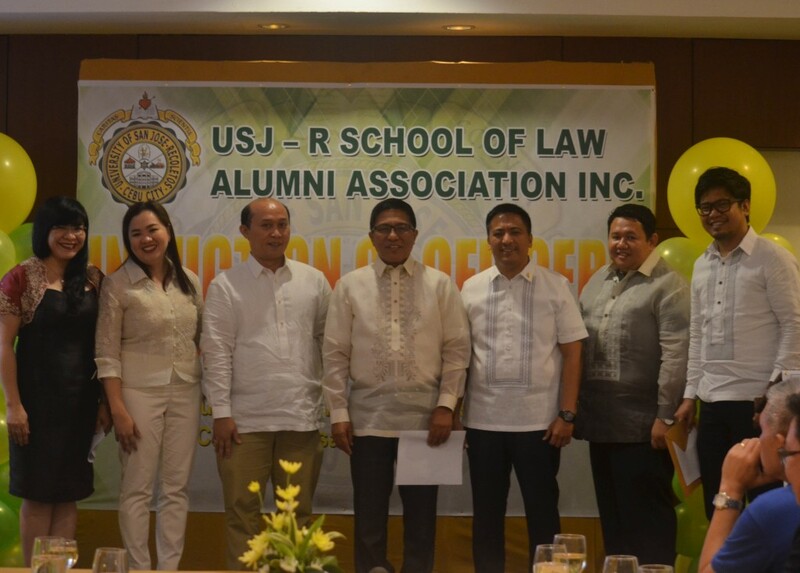 The new administration of officers for the University of San Jose – Recoletos (USJ–R) School of Law Alumni Association were officially inducted last May 30, 2018 at the City Sports Club Cebu. 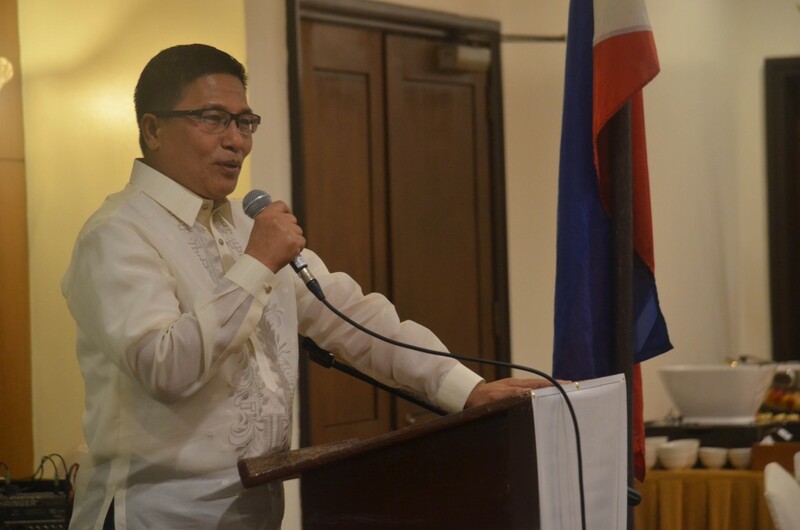 Former Cebu Port Authority Commissioner Atty. Tomas A. Riveral will begin his tenure as the newly elected President, and in his side, several Josenian lawyers. Atty. Riveral brought his comedic side to his Acceptance speech, joking about the facilities and his so-called “simple dreams” while taking up his Law degree in USJ – R.
“For married students like us, we had very simple dreams. One was to win arguments in the classroom, because we could not win arguments at home,” Atty. Riveral jokingly stated. He then finished his “simple dreams” piece by stating that he wanted to provide for his family and become an advocate for Justice. He also mentioned in his speech that he will donate Php100,000 from his own earnings to the School of Law. The newly elected officers of the USJ-R School of Law Alumni Association Inc. with University President Rev. Fr. Cristopher C. Maspara, OAR. Joining Atty. Riveral in the Board of Officers is Vice President and 2004 Batch Representative Atty. Catherine Cabalse – Fontanoza, Secretary and 2006 Batch Representative Atty. Lorena Deemia Manuales – Garaygay, Treasurer and 2011 Batch Representative Atty. Margarito Montecillo, Auditor and 2015 Batch Representative Atty. Emmanuel Lim Tampus and PROs Atty. Jairus Socias and Atty. Ver Celito Raymundo. Several other Batch Representatives were also introduced in the Induction of the officers. Former President of the Association, Atty. Mae Elaine Bathan shared her words of encouragement before turning over the positions to the new batch. In her speech she recounted several things that she learned while being the President of the association, including that Law students take inspiration in their alumni. “We will not rest, until we get to the top,” Atty. Bathan quotes School of Law Dean Atty. Jonathan P. Capanas. Atty. Capanas also mentioned that one of the secrets to success in different universities around the world is good support from their alumni. “We need the Alumni Association to become stronger, because we need their support,” Atty. Caparas said. Atty. Tomas A. Riveral giving his acceptance speech as the new President of the USJ-R School of Law Alumni Association Inc.
Atty. Capanas also shared that the School of Law has garnered several achievements such as having a top-notcher in the 2017 Bar Exam. “This association will continue to grow, because we do not only produce law graduates but also Josenian lawyers.” Atty. Caparas said. University President Rev. Fr. Cristopher Maspara, OAR was also present and gave an inspirational message to the newly elected officers. “For the School of Law and Alumni Association to progress, the members should cultivate memorable relationships.” Rev. Fr. Maspara said.